Mornings are tough. If you’re not intentional about them, they become something to be survived instead of enjoyed. It’s hard to embrace mornings when you’re up during the night nursing a baby, the house is still strewn with yesterday’s clutter, and you know that day holds more of the same stuff that exhausted you yesterday. And I’m so conflicted about this. No one needs more mommy-guilt, so I’m not here to tell you of a way you “should” do your mornings. Only you can figure that out. But there are some things to consider while you make that choice. Why Even Have a Morning Routine? Personally, I like to wake up slowly and to a still and quiet home. The only way that can happen is if I am up and at it before anyone else (and if none of the kids is talking in their sleep…yes, that happens…often…). I genuinely love the early morning stillness, that nearly magical time that the sun is low in the sky and its light is filtered by the trees and I can hear the Spirit whisper more clearly; it restores my soul and prepares me for the day. But, bless it, it just happens so darn early in the day. However, there are a lot of reasons to have a morning routine. First of all, how you start your day is literally the foundation you will build the entire day upon. It’s important. Whether you start your day at 4 a.m., 8 a.m., or noon, the way you start it sets the tone for how you will spend it. Also, if you haven’t prepared yourself for what’s ahead, you’ll constantly be playing catch up instead of being productive. There has to be a way to go behind survival mode in the mornings. There needs to be a way to launch yourself into the day with joy-filled purpose. Let me ask you a question: How do you start your mornings when you are on vacation? For me, it’s with a cup of hot tea or coffee, my Bible, and a heart open to hear the whispers of the Spirit. And peace. Sweet, restoring peace. When you have those things in the morning, the rest of my day can bring what it will and you can meet it without being swayed because you started out anchored firmly to the Word. I want that. Heck, I need that. And honestly, my kids need me to have that so that I can be a better mom for them. 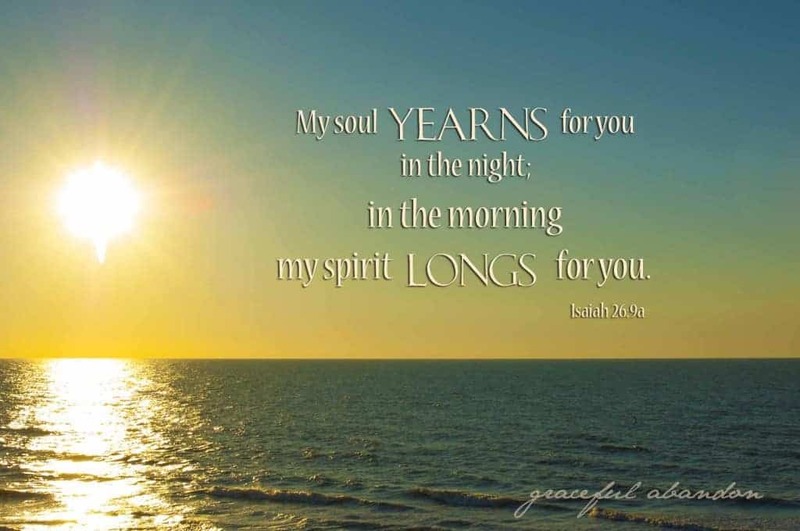 Whether I realize it or not, my soul and spirit desperately need God. When they are deprived of Him, they begin to starve. Starving people do desperate things, things they would never do if they weren’t delirious from their need for sustenance. We’re all like that. When you are ravenously hungry, you get ‘hangry.’ And when you starve your soul and spirit, you act in ways you would never think of behaving otherwise. You become unstable and easily misdirected throughout the day because when you neglect to tether yourself the Anchor of you Soul each morning. Consider preparing for your morning the night before. The key to a stellar morning routine is a stupendous evening routine! You want to be prepared to wake up for your day and not just to it. Related: 7 Things To Do At Night That Will Make Your Mornings Awesome! No rocket science, nothing earth-shattering. But it only works when you actually do it. Kids like it, too. Routines provide security and stability. They love the aroma coming from the crockpot when they wake up, and the simplicity of just scooping breakfast into a bowl or onto a plate. The Early Mom Gets The Wow! They say the early bird gets the worm, but who wants worms anyhow? But you do want peace, joy, and most likely coffee. This time when you first wake up is how you set the tone for what is coming. You’ve probably heard the saying: Win the morning, win the day. It’s so true! My grandmother used to tell me that all the time, and she was right! Get up before the rest of your household. Prepare your heart for the day ahead. Take a few moments and read a few verses or a chapter of the Bible. Add a devotional if you’d like (my favorite is My Utmost For His Highest!). If you’re a mom, prepare your heart in prayer to love your children. Ask God to give you words of wisdom and kindness for them (Proverbs 31:26 says that the woman whose children call her blessed speaks with wisdom and kindness). Things go more smoothly when mom is up first, and attitudes do better because mom is there to diffuse any tense moments caused by sleepyheads who are still waking up. 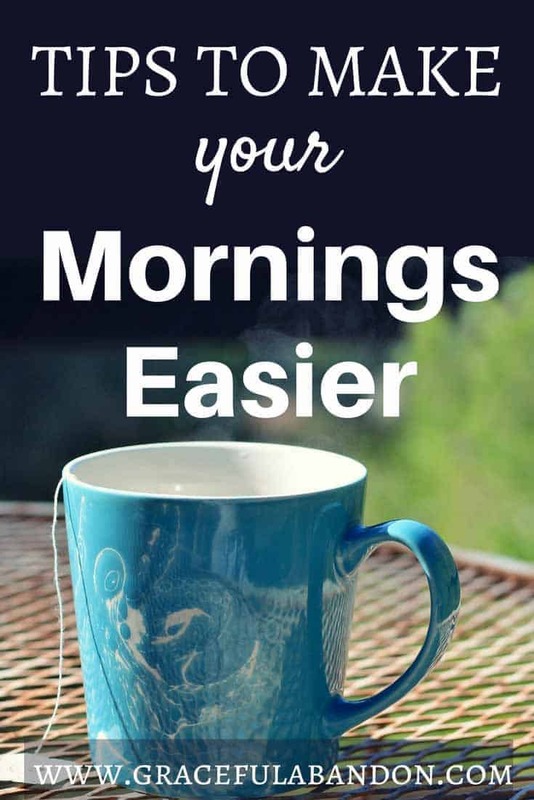 So ask yourself, what do you need to have a morning routine that sets you up for success? For your home, it could look totally different than mine. And that is 100% okay. I promise. Sit down and write down what isn’t working and think of a way to make a change. I bet the whole family will be thankful you did. 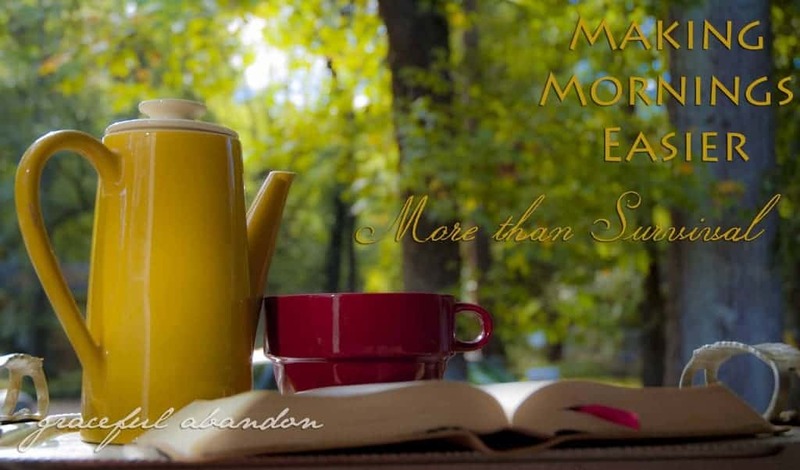 Just don’t forget the most important part: it allows you to start your day anchored to God and with a satiated soul. No more desperate, hunger-dominated choices!